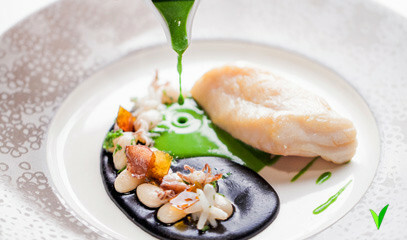 In the last 25 years, The Square has established itself as London’s go-to restaurant for sumptuous classical cooking. Indulge with this critically-acclaimed tasting menu for two people, followed by an exclusive-to-Truly kitchen tour, and meet the team behind some of Britain’s best food. This is part of our unique dining experiences collection. Since opening in 1991, The Square has established itself as one of the Capital’s most iconic restaurants. The down-to-earth yet exceptional service and world-renowned food has slotted seamlessly into London’s most affluent postcode. Much of that is down to the faultless cooking and revered wine list, meaning that The Square has been a hit with the critics from its beginning. 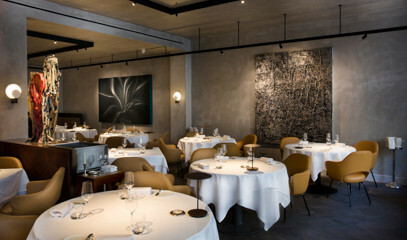 One of the first British kitchens to combine the best seasonal produce with modern French techniques, The Square guarantees high impact dishes packed full of character and flavour. The Square’s commitment to great ingredients is matched by the award-winning wine list; most recently the restaurant was given the highest rating in ‘The World of Fine Wine’ magazine. The 1500-bins that make up the wine list has been carefully assembled by Head Sommelier Lorenzo Cioli. Cioli and his team are on hand to navigate you through their cellar; we recommend treating yourself the expertly paired wine flight to match each course of the tasting menu. The Michelin-starred, Executive Chef Clément Leroy brings his signature interpretation of the French cuisine by shunning cream and butter, in favour of texture and lightness, so that diners may savour the true taste of the ingredients and enjoy every bite. Drinks (e.g. matching wines) and other extras are not included; any additional products or services consumed can simply be paid for on site. Service charge (12.5%) is not included in the price of this experience and will be charged as an optional gratuity on the day of the experience. The Square is open for dinner Monday to Thursday, 6.30pm to 10pm, Friday to Saturday, 6.30pm to 10.30pm, and Sunday, 6.30pm to 9.30pm. The menu is subject to seasonal change and availability. Please state any dietary requirements at the time of booking. Note that at least 48 hours' notice is required for any cancellations or changes to bookings. "An experience to remember "
"A first class dining experience"